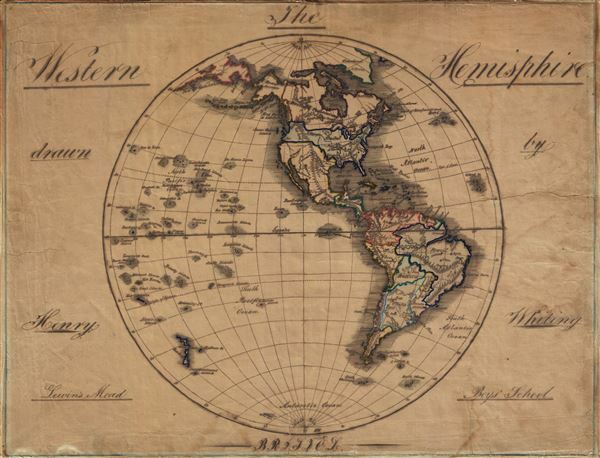 This is a delightfully whimsical school boy manuscript map of the Western Hemisphere by Henry Whitney. It depicts North America, Central America and South America on a hemispherical projection. Greenland, Polynesia, New Zealand, and the eastern parts of Asia are also featured. The map was hand drawn by Henry Whitney, of the Lewin's Mead Boy's School in Bristol, England, and given the cartography featured in the map, dates to sometime between 1810 and 1820. Schoolboy or schoolgirl maps began appearing in England and the United States in the later part of the 18th and the early 19th century. These wonderful, fascinating, and often whimsical maps are the product of a radical change in education taking place at this time. Many of the schools (especially the school attended by Henry Whitman at Lewin's Mead, Bristol, which at the time was regarded as a slum), were highly underfunded, and lacked proper education material such as maps and books. One way of adapting was to learn geography by copying maps and atlases borrowed from other institutions. The map depicts the boundaries of the United States prior to the Mexican-American War, and shows American claims to British Columbia. The mapping of Polynesia is particularly interesting. Although Hawaiian Islands are correctly marked, various other islands appear to be either unknown or fictitious. These include the Mistake Islands, Arrowsmith's Island, Massachusett's Islands, Cornwallis Island and several others. Although the map offers limited inland detail, it exhibits very fine and beautifully rendered topography. Features wonderful elaborate calligraphy used throughout, with wonderful hand color and whimsical overall presentation. Overall a rare and beautiful example of a school boy manuscript map. Very good. Overall age toning. Backed with original linen. Paper cracked at places along borders. Some spotting and damp stains at places.